Captain John Scudder of Flamingo Belle Charters, Joel Brandenburg’s grandfather, anchored this family of charter captains. This old photo shows him with a snook caught in South Florida. Even though snook is out of season during the summer — we still target them. We fish for snook for the sport. The thrill of catching a snook is unforgettable for most anglers. For anyone who has never caught a snook, it’s hard to describe in words — but I’ll try. The snook strikes like a jack, initially runs like a kingfish, jumps like a tarpon, digs like a cobia and has the stamina of a snapper. When you boat a snook, you’ll not only notice the beauty of one of God’s finest creations, but you’ll also notice that a snook was built for speed and power. If you want to fight a fish that does it all, hang into a snook and you’ll be hooked for life. 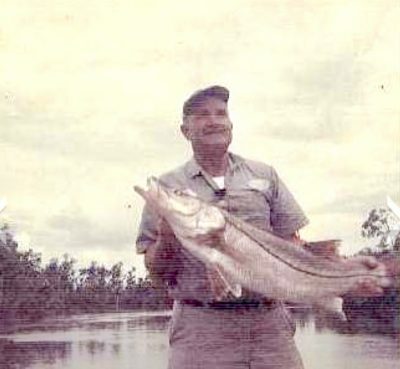 Snook are in season for several weeks during spring and again in the fall. On the west coast of Florida you can keep one per person, per day with a slot measuring 28- to 33 inches from the tip of the bottom lip to the tip of the pinched tail down the lateral line of the fish. Several marine biologists agree that a slot-sized snook is one out of a 1,000, and an over-slot snook is one out of 10,000. During the summer you can target big snook because females gather in one school, and the males stay nearby in a separate school. Most snook are born male and stay male for an average of seven years. Once a snook reaches the 26-inch range, they turn into a female and begin spawning in the summer. If you hook a snook over 26 inches keep fishing that hole because there’s likely going to be other female snook to strike. Captain Joel Brandenburg, owner of Ana Banana Fishing Company, is the second generation in his family to be a charter captain. The reason for the small 5-inch-slot range is so a snook can reproduce for at least two summers before it is harvested. A snook that exceeds 33 inches is more likely to breed offspring that will have the same genetics and likely to grow over slot. Over-slot snook produce abundant and healthier eggs. Snook are a tropical fish and very sensitive and susceptible to extreme weather conditions. One example is during the heat of summer when red tide rolls in. Snook are one of the first fish to go belly up. Another example is the record freeze of 2009. We didn’t have the lowest temperature on record but we did have the most consecutive days in a row of below 32 degrees. Over a million snook were either floating dead or permanently paralyzed, eventually facing death by starvation, or being eaten by a predator. Some man-made accidents have killed snook, too. Such as the insecticides used by agriculture flowing into our waterways in the Everglades and around Okeechobee, or the chemical spill that happened in Tampa Bay years ago when a toxic waste dump pond suffered a burst dam and thousands of gallons of toxic chemicals poured into the bay. Also, the BP oil spill in 2010. Master Captain Joseph Brandenburg of Ana Banana Fishing Company is the third generation in his family to be a charter captain. 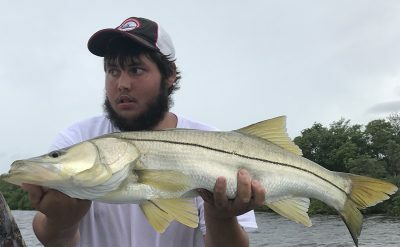 Because snook are such a majestic fish, I’m proud of the attention our law enforcement, scientists and fellow anglers give it to assure their long-term existence. 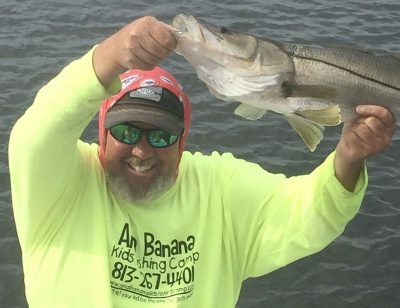 If you’d like to hook a snook, call Captain Joel Brandenburg at 813-267-4401, or visit www.anabananafishing.com.